Coerver® Coaching Co-founder Alf Galustian recently interviewed Gerard Houllier in Paris to discuss the work that they have done together over the last 20 years including the impact that the Coerver Coaching programme has had on elite player and coach development in France during this period. AG: As always, good seeing you, what are you doing now?. GH: Currently I am Global Sporting Director for Red Bull Football, we have 5 professional football units. Austrian side FC Red Bull Salzburg, Germany’s RB Leipzig , New York Red Bulls from the US A, Red Bull Brasil and the Red Bull Ghana academies. AG: it’s almost 20 years since you invited me to come to the Clairefontaine National Training Centre. Please go through the background that preceded this invitation. GH: As a professional coach and then as technical director of the French Federation, I had heard about Wiel Coerver and his methods, but to be frank, myself and many of my staff were a little sceptical. We agreed that focus on technical teaching was important, but from what we saw in the work, at that time, many of us felt it did not relate or move on to game conditions quickly enough. When I met you and you explained to me your ideas on technical teaching, I was keen to see for myself. AG: I remember well the first course I did for you at Clairfointaine in 1994; to tell you the truth I really felt nervous because there were so many high profile coaches. GH: In fact if you recall, the first course you did was for our 15 National Team Coaches; This included Aime Jacquet, the National Team Coach and coaches from every French National Team men and women, so no wonder you were nervous. I was honest with you at the beginning, I left it to our National Team Coaches judgement, whether they liked what you presented or not. As you know they all came back to me, after your session, saying they were convinced that this teaching could be of great importance to us in France. I have to tell you that one of your biggest supporter was Aime Jacquet, who went on to win the World Cup. The second course you did for us in the early days of the following season, was for the 120 National and Regional Coaching Directors of France (see below image). This course led to the many invitations you received to teach players and coaches at top pro clubs and our regional training centres. AG: You have jogged my memory, yes those first two courses were crucial, I remember that I presented Ideas on Technical Teaching to Elite Players and how I thought Coerver had evolved. Do you remember the feedback that you got on that?. GH: Yes, that day you convinced even the most sceptical of coaches, that Coerver was about teaching effective use of skills and not just skill for its own sake. Many of our coaches had seen Wiel Coerver work or had his videos; you showed us the evolution of the method and how it had changed and moved on. AG: I remember shortly after these initial courses coming back to Clairefointiane at your request to video some of our work for your Official Library. GH: Yes and to this date almost 20 years later, the videos and work you did are still used as a resource for our coaches all over France. AG: I was lucky to continue working with you for over 17 years all over France. GH: As technical director I received reports of all your work. I recall especially those at Auxerre, Marseilles, Lyon, Bordeaux and Paris.I really feel your effort and work in France over so many years, has helped us produce so many good creative players. AG: I have been lucky enough to work at many Federations and Top Clubs around the World, and in my opinion, the French Youth Development System under you, is the best that I have seen. GH: Thank you, we worked hard and Youth Development was a priority for us. Winning the World Cup validated our ideas and new orientation in our work. Coerver® Coaching are delighted to announce that they have entered into an agreement with Sports Stars Media plc (“Sports Stars”), the Portuguese-based sports animation and media company. 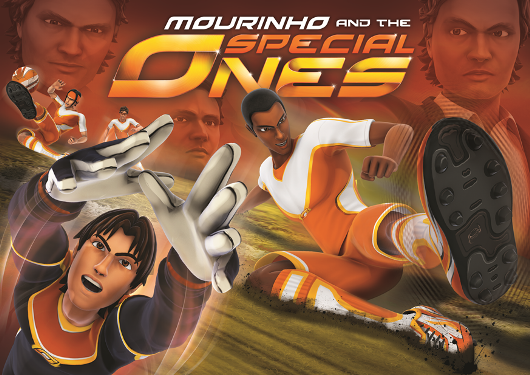 The organisations will collaborate across a number of media platforms with Coerver® Coaching providing soccer skills know-how to be showcased in the up-coming Mourinho and the Special Ones TV series (See below image), Mourinho Trading Card Game and the Multi Skills Cup. This new agreement with Coerver® Coaching is the third major signing by Sports Stars Media PLC in the last 18 months following on from securing the image rights for Jose Mourinho for the animated TV soccer series, which will promote the sale of the Mourinho Trading Card Game with 3D Augmented Reality, and a global online soccer league competition fronted by one of the world’s top footballers, Cristiano Ronaldo, called the Multi Skills Cup. The initial filming days for the Mourinho content were staged at Coerver® Coaching Partner club, Stoke City FC, who provided the players and facilities for the shoot. 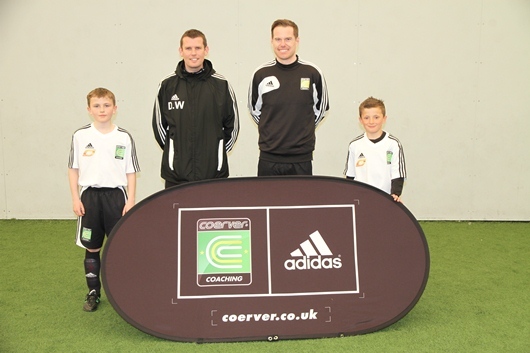 Coerver® Coaching would like to thank Stoke City FC for their assitance on this project. (See below image Coerver® UK Director, Scott Wright with Stoke City FC Academy Manager, Dave Wright with the academy players that participated in the filming). Coerver® Coaching are delighted to announce that the first European Youth Diploma of 2013 will be hosted by Spanish giants, Real Madrid CF. The course will take place between the 14th & 15th May 2013 at the “Los Blancos” Valdebebas training centre which is widely regarded as one of the best professional sports training facilities in the world (see below image). Coerver® Coaching co-founder Alfred Galustian said of the course, “It’s a fantastic way to kick off this year’s Youth Diplomas in Europe. I really look forward to working at Real Madrid again, the last trip was very good especially learning from the then Technical Director of the Club, and now current Spain Head Coach Vicente Del Bosque”. (see below image). Real Madrid CF first team coach, Jose Morais attended the Coerver® Youth Diploma course in Birmingham in May 2011 and also attended the Youth Diploma course in Madrid in December 2012 (see below image). 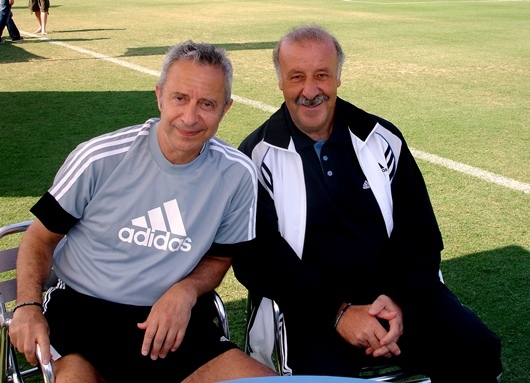 Jose said “I am a long-time fan of Coerver Coaching, and recommend it to every coach I meet. I use some of the Coerver work with the First Team at Real Madrid and one of the wonderful things about Coerver is that it can be adaptable to players of all abilities”. Jose added “At the early ages the foundation of teaching should focus on technique, Coerver was the first time I had been exposed to a curriculum, which focused on this philosophy. Since the early years, Coerver has added game related and full game pressures to all of the skills, that was perfect for me in my work”. “Football is changing so the skills needed by the players are also changing, young player’s today need to be able to make killer passes, to turn at speed and to dribble past defenders. Repeatable drills can stimulate players to improve in all of these areas”.